Since my last batch of dry cure bacon had been finished up a while ago, it was high time I made some more. Although I was pleased with the last lot, I was slightly annoyed by the fact I had to soak it in water to reduce the saltiness, as the flavour from the rosemary, sugar and black peppercorns will have also been reduced. Whilst browsing the River Cottage forums one day, I read about other people who had had the same problem when following Hugh Fearnley Whittingstall’s recipe for dry cure bacon. There was one person, Howard, who had done alot of research and looked at several different recipes before he tried curing his bacon, and said it turned out beautifully. So I decided to follow his guidelines. I love making bacon. Such a simple procedure, with such amazing results. It’s quite comforting to have a load of delicious streaky bacon sitting in my fridge, waiting to be turned into something tasty. Again, I got a hold of a whole pork belly (I don’t like to do things by half), but it wasn’t all for me; the other chefs Marc, Marcus and Alan from work were going to split the cost with me for a piece of bacony loveliness. I was more adventurous with the flavourings this time; nutmeg and rosemary were the primary notes, with undertones from a few other spices also coming through. I did actually end up soaking the bacon, but only for 1 hour this time, so the extra flavours were still noticeable in the finished bacon. I didn’t manage to get a hold of any salt petre unfortunately, so the bacon won’t keep its pinkness when cooked. The flavour will be unaffected though, which is the main thing. I’m very happy with the end product; I have delicious things in store for it. 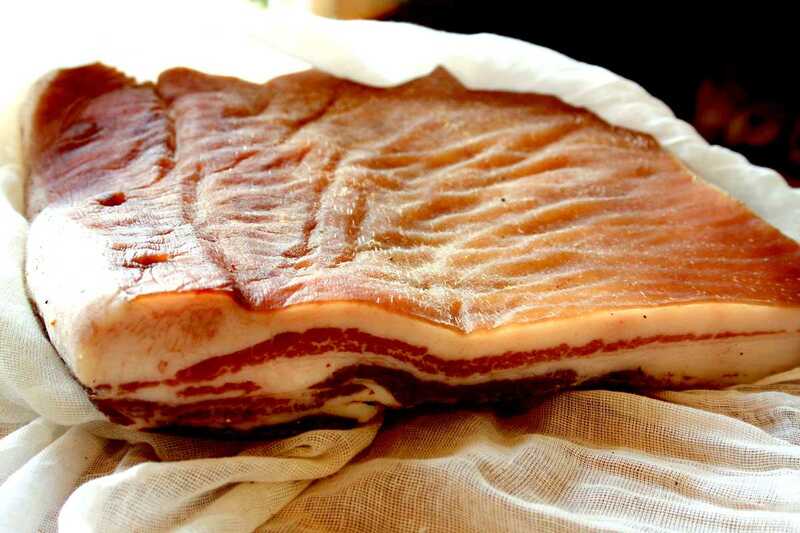 It was a source of comfort and joy to have my bacon hanging up in the kitchen, slowly maturing and increasing in firmness and flavour. Everyone should try making bacon, it’s so easy, and you will have a product which is many miles better than anything you can get in a supermarket. Mix all the ingredients except the pork together in a bowl. Rub about three-quarters of the mix into the belly, leave in the fridge for 24 hours then pour the liquid away and repeat, but only adding a small amount of cure mix after the first day. Cure it for 4 days, then cut off a piece and fry it to test for saltiness. If it’s too salty, just soak it under running water for an hour or longer to reduce this. Finally, wrap it in muslin and hang for a week in a cool larder to dry and allow the flavour to mature.